Five-time world champion Viswanathan Anand salvaged a draw after suffering for long in the seventh game of the World Chess Championship against Magnus Carlsen here on Monday. Elated after India decimated Sri Lanka with a clinical precision in the just-concluded ODIs, stand-in skipper Virat Kohli said the biggest take-away from the hurriedly-arranged series has been the positive and aggressive attitude that his team displayed all through. The Justice Mudgal Committee's report, contrary to some claims, has not given a clean chit to N Srinivasan, the in-exile BCCI president and owner of IPL team Chennai Super Kings (CSK). Riding on centuries by Thirush Kamini and Poonam Raut, the India women team scored a massive 400 for six declared and then reduced South Africa to 85 for three at the end of the second day of the one-off Test match, here on Monday. Mumbai City FC and FC Goa played out an action-packed goalless draw in the Indian Super League clash after both the teams failed to score on many occasions at the DY Patil Stadium. It seems the relations between Terry Walsh and Hockey India (HI) has hit the rock bottom. Walsh, who had resigned as the head coach of the national team on October 21, has made his differences public with Hockey India, offering a sneak peek into the “suffocating environment” he has been subjected to in the federation over the past few months. Walsh, who is serving a one-month resignation notice period, said the time was running out for Hockey India to make a decision as his contract expires on November 19 and he wouldn't be staying back for a single day. It was always a David vs Goliath battle in every sense. Much before Kidambi Srikanth took to the court against the ‘Super’ Lin Dan in the summit clash of the China Open Premier Super Series, the result was a foregone conclusion. There was a reason to believe so — a look at Lin Dan’s career would show why the Chinese star is such a genius. Before coming into the match, he had played 559 matches with 495 wins and just 64 losses. Opener Tom Latham struck his second consecutive hundred to keep New Zealand on course for a big first-innings total on the opening day of the second Test against Pakistan on Monday. Delhi Dreams made a splendid start in the inaugural Champions Tennis League (CTL), winning all the singles matches for a 25-19 victory over Punjab Marshalls in the tournament-opener here today. Under-pressure coach Guus Hiddink breathed a sigh of relief on Sunday as the Netherlands outclassed Latvia 6-0 to give their Euro 2016 qualifying bid a shot in the arm. The outstanding Arjen Robben and Klaas-Jan Huntelaar both scored twice with captain Robin van Persie and Jeffrey Bruma also on target as the Oranje claimed just their second win in four games in Group A.
Novak Djokovic laid down the challenge to his rivals on Sunday after completing another year as world No.1. “Right now, I’m at the pinnacle in my career,” the 27-year-old Serb declared after claiming a third consecutive ATP World Tour Finals title by default when Roger Federer withdrew before their showpiece final with a back injury. A visa dispute is threatening to disrupt Pakistan team’s participation in this week’s Track Asia Cup cycling championships to be held at the Indira Gandhi Stadium Velodrome here. India’s Saurav Ghosal earned a hard-fought 3-1 win against Pakistan’s Nasir Iqbal to enter the pre-quarterfinals of the World Squash Championship here today. Trying to recuperate from a double blunder in the previous game of the 12-game match, Anand did not show any signs of fatigue and matched Carlsen move for move in what was considered a grudge game. For the record, it was as theoretical as it could get in a world championship match. Carlsen went for the extensively analysed Berlin defense with his white pieces — an indication that the Norwegian word champion had worked out a plan to tackle Anand's deep preparation in the opening. As it happened, Dutch Grandmaster Anish Giri could not stop himself from tweeting that 'when it came to Berlin, Carlsen knew who to follow'. The Dutch GM was obviously referring to his game against Teinmour Radjabov of Azerbaijan just a couple of weeks back. And after Carlsen followed him to the hilt, there was no doubt that Giri was making sense. Anand in fact checked himself not to follow that game and it was clear that the Indian ace had analysed the details. Instead what followed was a deeply analysed sequence of moves, wherein Anand had worked out his way to equality. "These are the kind of position when you have to be lucky, but if you are playing in a world championship match you better be correct," said Grandmaster Abhijeet Gupta, who has been keenly following the match. 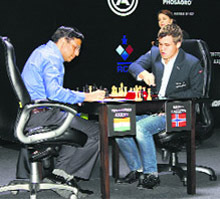 It was a piece sacrifice by Anand that opened the debate. The Indian ace was thereafter trying to figure out a way to defend a piece down endgame which was theoretically drawn. India crushed Sri Lanka 5-0, completing the formalities with a three-wicket triumph in the final match of the series last night. “Guys being positive and aggressive rather than defensive and negative... that's something we're really stressing on. Even if a bowler is getting hit, as long as he's looking to take wickets and not looking to get away — that's the change we need,” said Kohli. “That's something we have decided as a group in the series and it has come out beautifully,” he said. Stressing on the new-found aggression, Kohli said it was a challenging task to beat their sub-continental rivals so convincingly. With an inexperienced side under him, Kohli batted at number four but the flamboyant right-hander said his gut feeling was to bat at his usual number three. “I can't comment on it right now but as long as we're strong in the middle-order I don't see any reason to keep batting at four. I've scored most of my centuries and won most of the games for the team at No 3. “As long as I play the same way as I did today, that serves right for the team. You never know, I'm comfortable batting at No 3 and 4 both. I will go with my gut feel as well as what the team requires of me. I'm learning to bat at other position also if the team requires,” he added. The Mudgal Committee report has said that there is no evidence that Srinivasan was personally involved in betting or match-fixing, or that he tried to obstruct investigation into last year's betting and spot-fixing scandal. This is serious, but all this was not even basis of the objection against Srinivasan continuing or reclaiming his post of BCCI president. His position was and is untenable because he misrepresented facts to the investigators, and because of the conflict of interest situation he is in. His IPL team's Principal, no less, was arrested and questioned during investigation into the betting and spot-fixing scandal. The team Principal, Gurunath Meiyappan, is also his son-in-law. Until investigations cleared Meiyappan, Srinivasan had no moral authority to continue as BCCI president. Srinivasan informed the Mudgal Committee that Meiyappan was not a CSK official but just a follower, an “enthusiast”, of the team. Srinivasan did not tell the truth about Meiyappan's position in the CSK to the Mudgal Committee because if a team's officials are found involved in serious wrongdoings, the team could be heavily penalised, even banned. The case against Srinivasan has become stronger, because the Mudgal Committee has found that he — and other IPL/BCCI officials — were aware of unspecified wrongdoing by a cricketer but did nothing. Resuming at 211 for one, the hosts dominated the day once again as they added another 189 runs to their overnight total, losing five wickets in the process, before deciding to declare the innings. Kamini, who resumed at 100, went on to hit a 430-ball 192, while her overnight partner Poonam, who was also unbeaten on 100, added another 30 runs before getting out at 130 off 355 deliveries. Kamini's knock was studded with 24 boundaries and one six, while Poonam hit 18 fours during her innings. For South Africa, Sunette Loubser was the most successful bowler with figures of three for 90. In reply to India's huge first innings score, South Africa did not have an ideal start as they lost two wickets for just 37 runs on the board. It was opener Nadine Moodley (40) and skipper Mignon du Preez (28 not out) who consolidated the innings and put on 46 runs together for the third wicket. At stumps on day two, Marcia Letsoalo (0) was unbeaten along with Preez. Off-spinner Rajeshwari Gayakwad (2/20) took two wickets for the hosts. The two teams had also been locked in a goalless stalemate in the first-leg encounter in Goa on November 9. The drawn game kept Mumbai in the fifth spot in the table with 12 points while the visitors too remained in seventh spot with 9 points, two better than bottom-placed Delhi Dynamos. Incidentally this was also Mumbai’s third successive goalless draw in the league. In a fast-paced opening half, Mumbai dominated the play through the major portion of the first half with French ace Anelka spelling constant danger up front after some lovely work in midfield by two other foreigners in the team — Brazilian Andre Moritz and Czech Jan Stohanzl.But they lacked sufficient support from the likes of Subash Singh, who wasted a few gilt-edged chances, and Lalrindika Ralte. Goa came into the picture late in the second half after an initial foray. The latter half saw both teams having an almost equal share of exchanges. The opening salvo was fired in the fourth minute by the visiting team when Mandar Dessai shot over the crosspiece from the left after using Brazilian midfield mate Andre Santos to run into the penalty box. But thereafter the Goa team’s players were left chasing their rivals. In the sixth minute Anelka volleyed the ball over on the run after outrunning his marker and compatriot Gregory Arnolin. Six minutes later the home team got its first corner award which went waste as Czech defender Pavel Cmovs left-footed on the turn wide of the post. “The support from the Sports Ministry and the SAI has been great, but we have to take some steps with regards to Hockey India if we want to solve the issue. The time is running out for them, the door is closing. The ball is in their court now,” Walsh said after a marathon six-hour long meeting with the Ministry panel, SAI officials, and Hockey India CEO Elena Norman here on Monday. Walsh had cited “difficulty in adjusting to the functioning of the country's bureaucratic system” as one of the main reasons behind his decision to resign as the chief coach. Walsh also rubbished reports which stated that he had asked for 120 days of paid leave in Australia, during which he will stay in touch with the team through video conferencing. Walsh said the two meetings, which he has had with the Ministry panel comprising former hockey captains Ajit Pal Singh, Zafar Iqbal and Ashok Kumar, have remained inconclusive so far. “It seems rather crazy to me that even after 10 hours of meeting, the issue remains unresolved. We have to move forward on certain issues. From my perspective, I've resigned on October 19, and I have just two days left before my contract expires,” he said. Ajit Pal, chairman of the committee, refused to share the details of the meeting and, instead, asked Walsh to review his list of demands, which include more freedom in the decision-making process and team selection, appointment of a scientific advisor from Australia, and issues concerning his paid leaves. “We had a long meeting today, and we would most likely have another round of talks on Tuesday. I am hopeful of a resolution,” he said. Walsh has called for a press conference on Tuesday to announce his decision. It was always a David vs Goliath battle in every sense. Much before Kidambi Srikanth took to the court against the ‘Super’ Lin Dan in the summit clash of the China Open Premier Super Series, the result was a foregone conclusion. There was a reason to believe so — a look at Lin Dan’s career would show why the Chinese star is such a genius. Before coming into the match, he had played 559 matches with 495 wins and just 64 losses. Compare this to Srikanth’s record — 104 matches, 67 wins, 37 losses — and one would need no further explanation to illustrate the gulf between the two players. So, for Srikanth, who recovered from a serious ailment — a bacterial infection in his brain — a few months ago to beating his childhood idol, Lin Dan, the outcome was nothing short of living a dream. “I never thought about the win. It’s a dream come true for me. The feeling is yet to sink in. I knew that a player like Lin Dan can make a comeback anytime, so I remained focused till the last point. Beating my childhood idol was just great,” Srikanth told The Tribune. For Lin Dan, the defeat was his first in a final since the 2012 Korea Open to Lee Chong Wei of Malaysia. Srikanth returned with a title from his very first World Super Series final, and the win came shortly after Saina Nehwal won the singles title — giving India an unprecedented two titles at the event. Srikanth was an unheralded player in the badminton world in 2012, with a ranking of 240. The rise from 240 to a current world ranking of 13 was no easy task for the Guntur boy from Andhra Pradesh, and the lanky lad had to sweat it out in Pulella Gopichand's academy for months to become a ‘giant slayer’. Srikanth said he played a smart game against Lin Dan, not allowing the two-time Olympic champion to unleash his thunderbolts and cross netshots. “There was nothing to lose. I just wanted to go out and enjoy my game against him. There was no pre-planning, but just a confident approach. I want to carry the momentum in coming tournaments,” he said. The reigning National Champion does not want to burden himself with the pressure of expectations. For him, the victory gives him the motivation to perform better. “I am focusing on the next Super Series. My next aim is to do well in Hong Kong and qualify for the Super Series Finals in Dubai (December 17 to 21),” said the player with a world ranking of 16. Only the top-eight of the Super Series play the Finals and Srikanth is currently ranked No.9. Opting to bat first after winning the toss at the Dubai International Cricket Stadium, the visitors, trailing 1-0 in the three-Test series, reached 243 for three wickets at the close. Latham, who scored a century in the first Test in Abu Dhabi, remained unbeaten on 137 with Corey Anderson on seven. The 22-year-old Latham, playing his sixth Test, displayed good temperament and solid technique against both the fast bowlers and the spinners and reached his century with a single off paceman Ehsan Adil. The left-handed batsman survived a close lbw appeal against Adil on 11 and edged Rahat Ali on 71 but the ball went between the wicketkeeper and first slip. According to the league format, the team that wins more games wins the tie and not the sets. Juan Carlos Ferrero provided a fiery start to the hosts as he routed Greg Rusedski 6-1 in the legends singles to put the hosts ahead. World No.15 Jelena Jankovic from Serbia shrugged off a poor start to beat Garbine Muguruza 6-5(5-3) in the women’s singles and Kevin Anderson spanked Somdev Devvarman 6-1 in the deciding men’s singles when Delhi were leading Punjab by a slender one-game margin. Punjab, led by the charismatic Leander Paes, won the mixed doubles and men’s doubles. Paes featured in both the matches. Punjab’s hopes hinged on Somdev but the 6 feet 8 inches tall Anderson showed why he is world No. 16 as he demolished the challenge of the India No. 1 in a matter of minutes. The South African sprayed winners all over the centre court with a hapless Somdev gasping. The Indian, ranked 139, could hold his serve only in the first game as close to 1000 fans watched their hero go down. Ferrero hardly broke a sweat in outplaying the 41-year old Rusedsky as the Delhi player needed just 19 minutes to provide a winning start to his side. Nicknamed ‘mosquito’ during his playing days for his agility, Ferrero conceded just four points on his serve and broke his rival thrice. The 2007 US Open finalist, Rusdeski, seven years older than Ferrero, fired two aces but hardly put up a challenge to the 2003 French Open winner. Ferrero hit a backhand winner past Rusedski at 40-40 in the seventh game to close the match. Hiddink, in his second spell as Dutch coach, had indicated that he would resign if his side suffered another disappointing result after suffering four defeats in their five games since finishing third at the World Cup in Brazil under his predecessor Louis van Gaal. Having already been beaten in the Czech Republic and in Iceland, Hiddink’s side still have some catching up to do but this result takes some of the pressure off with their next qualifier, at home to struggling Turkey, not until the end of March. Djokovic ends the season as number one for the third time in four years having won a seventh Grand Slam at Wimbledon and Masters 1000 titles in Miami, Indian Wells, Rome, Paris and this week’s year-ender in London. While arch-rival Rafa Nadal is still recovering from a wrist injury followed by appendicitis, Andy Murray is struggling to return to his best form after back surgery a year ago and 33-year-old Federer cannot hold back time forever, new dad Djokovic appears to be reaching his prime. In London, he dropped only nine games in his three group matches before seeing off Japan’s Kei Nishikori in the semis and he will start 2015 having clearly set the benchmark for men’s tennis. Djokovic said he was disappointed his year ended with a hollow victory — even if it meant he was the first to win the year-ender three times in succession since Ivan Lendl. Djokovic rejected any suggestion that Federer had pulled out to save himself for next week’s Davis Cup final. The Pakistan team has not yet been issued visa by the Indian High Commission in Islamabad for the Nov. 21-23 event, which would provide an opportunity for the participants to qualify for next year’s World Championships and 2016 Rio Olympics. There is no official indication from the Cycling Federation of India (CFI) on whether the visa would be granted. CFI secretary and Track Asia Cup organising committee member, Onkar Singh, said they are helpless with politics getting in the way of sport. Last year, too, an eight-member Pakistan team had to wait till the last minute before getting the visa for the Asian Cycling Championships. “We have approached the Ministry of External Affairs and urged them to give the clearance. We are hopeful of their participation,” Singh told The Tribune. The Track Asia Cup is one of the most prestigious events in the International Cycling Union (UCI) calendar and would see the participation of about 100 riders representing eight teams — Hong Kong, Thailand, Kazakhstan, Uzbekistan, Bangladesh, Pakistan, Malaysia and India — in both senior and junior categories. “This is a Class 1 event, which carries more ranking points than any other event on the calendar. The championship provides an opportunity for the Indian cyclists to accumulate vital points, which will enhance their chance to qualify for the World Championships and Rio Games,” Singh said. Singh said India would face stiff competition from Hong Kong and Kazakh cyclists. BCCI WC to meet today to decide new AGM date: The all powerful working committee of the BCCI will meet in Chennai on Tuesday to discuss the Mudgal Committe report and decide on a new date for its upcoming Annual General Meeting. With the earlier scheduled AGM on November 20 being cancelled, the working committee will decide on a new date, which is likely to be in the third week of December, and discuss the Mudgal Committee report that came out in the public domain. BCCI president-in-exile N Srinivasan will be attending the meeting in capacity of being the president of Tamil Nadu Cricket Association (TNCA). “There is not much that's going to happen tomorrow at the WC meeting. Most of the members who will be attending the meeting are Srinivasan loyalists. Also with Mudgal committee report sayinmg that he was not involved in fixing, the decks should be cleared for him contesting the the presidential post,” said a senior BCCI official. India score a dozen against Afghanistan, enter semis: The Indian women's football team on Monday sailed into the semifinals of the 3rd SAFF Women's Championship after registering a crushing 12-0 win over Afghanistan. As if recording mammoth wins against Maldives and Bangladesh were not enough, the Indian girls made Afghanistan look like they were playing a different sport, crushing their opponents with a ruthless approach in their last Group A engagement.